32" x 19" x 7.5" approx. I am satisfied with the purchase and the service provided. Very nice equipment! Fast shipping too! 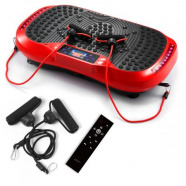 I first experienced a WBV (Whole Body Vibration) machine at a friend's house. He and his mother raved about the benefits. I did some reading of my own on WBV and decided to try it for myself. It feels like getting a Swedish massage once you go through the various exercises in the leaflet, wish there were more. There are websites you can get to and find WBV exercise charts. I've only had the device for a few weeks, will update later on results. Outstanding value. Well made. Received quickly in perfect condition. We've enjoyed the Genkifitness machine. 12 minutes twice a day as a supplement to my running. It works just about every muscle below the waist and abs. Just stand on it. Couldn't be easier. No excuses. Highly recommended. Love it! Highly recommend to those who don't have the time or don't want to spend thousands at a gym.